I want to learn about you! It can be used for pairwork to practise question form of present tense ,have got- has got...They can introduce the partner writing a paragraph.Have a good lesson! 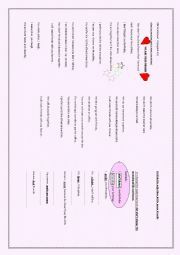 A poem for friendship,specially for students in Turkey,FORWARD ENGLISH Unit 1. You can use it to teach personal adjectives. 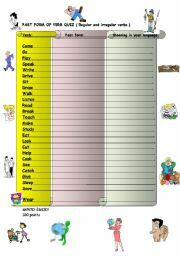 Repeating in class wasn�t enough so this is my way to have my students memorize past forms of verbs! What do they like doing? - Who likes .......? An animated ppt to study on hobbies,present tense,asking & answering questions specially for the pattern �who likes doing?� Have a good lesson!By the way,lots of thanks for your precious works! 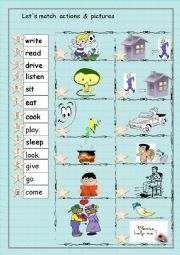 An animated slide...It can be used for story writing or practising continuous tenses.Have a good lesson! Sorry,I had to send it in two parts & change some slides because of size problem...The first part of my animated ppt on occupations & tools.The first part is http://www.eslprintables.com/powerpoint.asp?id=69473#thetop It�s for 5th grades in Turkey.Have a nice day! It�s an animated ppt for beginners.Specially young learners will learn usage of �am,is,are� with subject pronouns.Have a good lesson! (It�s updated,check it please! )This is the second part of my animated seasons ppt.It can be used for story writing,speaking about spring actions... The link for the first part: http://www.eslprintables.com/powerpoint.asp?id=67739#thetop Have a good lesson! This is the first part of my animated seasons ppt.It can be used to teach winter vocabulary (clothes , sports ...) Have a good lesson! You can use the PPT to teach clothes,colours, have got - has got .There are two links students will like ... Have a good lesson!